Psalm 91 is believed to have been written by King David. Its a psalm for protection for all those who believe in God and our Savior, Jesus Christ. Not protection by King David, who himself was in need of protection, but by almighty God. Note that in verse 2 the writer declares he'll trust God as his keeper and later in verse 9 draws on his own endorsement to encourage us to do the same. Psalm 91 contains a number of promises to those who place sincere trust in God, in particular that we'll be placed under the care of Heaven (v. 1-4), delivered from dark spiritual powers (v. 3, 5, 6), and put under the protection of guardian angels (v. 10-12). We'll defeat our enemies (v. 13), and be God's special favorites (v. 14-16). The devil quoted Psalm 91 to Jesus when he tempted Him in the desert (Matthew 4:6) so some believe that the protections in the psalm apply only to Jesus. However, its more commonly accepted that, as with all God's blessings, we receive this protection too by His grace through our faith in Jesus. We receive it through Jesus. Read on for a verse by verse explanation of Psalm 91. Verse 1 points out the general truth that those of us who are in touch with God will enjoy His protection - this is a given. So we can rest assured, having peace and holy serenity as the outcome. The verse says, "He that dwells in the secret place of the Most High, shall abide under the shadow of the Almighty" meaning that if we choose God as our protector (vs. mankind, Science, the world, etc.) we'll find in Him everything we could need or want. This makes sense in that as a true believer one would indeed 'dwell' in the realms of God through worship, prayer and spiritual awareness. And it follows that God would therefore be ever present in all of our worldly interactions, providing peace and protection throughout life's journey. In verse 2 the writer declares, "I will say of the Lord..." (i.e. 'This is what I think regardless of other's opinions...'), "He is my refuge...". He turns to God for protection. No other. This is because God "...is my fortress" his stronghold. A place to retreat from harm's way. Having experienced his refuge in God's protection, the writer encourages us to do likewise, choosing in verse 3 the words, "Surely he shall deliver thee..." not based on his own say so, but based on God's promise. The promise that we'll be delivered from dangers the psalmist compares to the snare of the fowler, which is to say, the method of snaring birds, implying the unseen pitfalls of life in this fallen world: unexpected danger around every corner that perhaps we're not even aware of. We have comfort knowing that God is protecting us from things unseen. Deadly pestilence. We have no idea what might become of us if not for the ongoing care of our loving God. In verse 4 we're reminded of the protection afforded chicks under the wings of a hen. She calls them under her wings when she senses danger and supplies warmth and safety. In this fallen world and in spiritual realms, we're just as helpless as those young chicks, so God likewise calls us under His protection. But unlike the tender, weak and easily broken wings of a bird, God's protection "...shall be thy shield and buckler". His truth is likened to the armor of war. God not only protects us from these evils, He also protects us from the fear of things evil. As humans we're subject to terror at night, whether it be fear of real threats such as robbers, home invasions, earthquakes and storms, or things brought on through our imagination such as ghosts, goblins and creatures of the night. In verses 5 and 6 we're told that, being under God's protection, we won't fear these things. Neither will we fear pestilence, that is we need not fear death and disease. Even in the daytime we might otherwise worry about "...the arrow that flies by day." Street violence, traffic accidents, workplace danger and the like, but the believer has peace. This is because we, having placed our faith in the living God, have that assurance of His protection in all things. Does that make us invulnerable? Of course not. But as God's children we know that nothing can harm us that isn't aligned with His will for our lives. We might lose our natural life, but our spiritual life is eternal. So we can move forward with confidence, knowing that when we're in full communion with God, allowing Jesus to live through us and hearing the voice of the Holy Spirit in our daily walk, then we're going to be OK regardless of any threats. When we see the fallen world around us with disease, violent crime and warfare, "A thousand shall fall at thy side, and ten thousand at thy right hand..." we remain under God's protection as long as we maintain our faith in Jesus and live our lives within His will for us. Verse 7 tells us that those around us might be falling in the thousands, causing us to realize that we may be next as things fall apart, but we're going to be OK. God is with us. As believers we see world events as outsiders, bystanders watching as the inevitable is played out in a world that is hostile to the gospel of Jesus Christ. Verse 8 infers the wicked in a world where Christians are at the very least mocked, and at worst persecuted and killed for their faith. Beheaded on video. When the unbeliever inevitably reaps his reward, we watch the destruction from the sidelines in spiritual safety and, of course, some sadness. Once again in verses 9 and 10 the psalmist reminds us that the God in whom we have made our habitation, or dwelling place, is indeed the God of the writer's own refuge. And because we too have placed our trust in God, "There shall no evil befall thee..." and no plague will come near our home. Again the implication is that having such character as to make God our own refuge, we receive the advantage and well-being of His promises. Its worth noting once more that even though we might encounter trouble , danger or ill-health, we can be assured that it doesn't come from evil. While we live in God's will we know that whatever happens to us has no evil in it. When we wander off the path we're likely to encounter evil at every turn, and the outcomes may fall outside of God's will. This is a concept that demands our faith. When bad things happen to good people are they the victims of evil or is it God's will for them to suffer? When we contemplate the deep meaning of Psalm 91 we begin to understand that both causes are possible. You might be living according to God's will for your life and yet you encounter pain and suffering. If we believe God's word as written in Psalm 91 and throughout the Bible, we know that while we abide in Jesus Christ, and He in us, then all events in our life are sanctified. And while we may not understand the reasons for pain, suffering and the things we perceive as negative or wrong, we can be assured that in the end, they occur for our own good or for the greater goodness of the Kingdom of God. 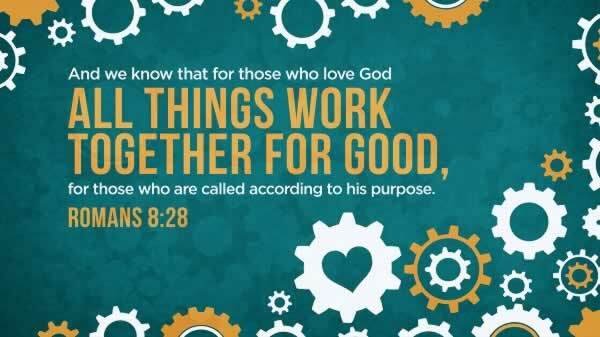 Romans 8:28 reminds us that, "...for those who love God all things work together for good, for those who are called according to his purpose." One of the methods employed by God to afford us His protection is to place us under the guardianship of His angels. The words in verses 11 - 13 of Psalm 91 are well known and, as stated above, were employed by Satan to tempt Jesus in the desert. "For he shall give his angels charge over thee..."
Of course, Satan left out the key qualifier, "...to keep thee in all thy ways" which is to say, as you travel on the path God has set before you, because this speaks against the devil's own destructive designs. The fact is that God has instructed His angels to walk the path with us as His church and as individual believers. That the angels bear us up in their arms invokes a sense of affection as one might lift up a child from harm. 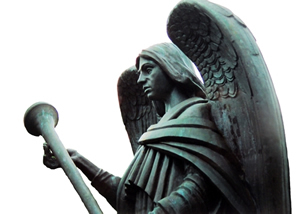 In doing so the angels keep us from a figurative dashing of our foot against a stone, a further measure of God's protection from harm or temptation to stumble into sin or distress. Instead, we're more likely to tread upon the lion or the adder (snake, dragon). These are the names of Satan. While under God's protection, with the help of His angels, we will disrupt the work of the evil one. Finally, God Himself is heard through the inspired words of the psalmist. In Psalm 91 verses 14 - 16 the Lord declares His intent with regard to His children. He will deliver us because we love Him. We know His name, that is, we're in communion with Him, so He will lift us high - protect us. In doing so, God will hear the prayers of believers, rescuing us and honoring our faithfulness. We'll be satisfied with our life and, unlike the unbeliever, we'll have no desire to cry out for more time to pursue worldly satisfaction. He has shown us His salvation in the person of the Messiah. We know that by accepting God's free gift of salvation through Jesus Christ, we have that blessed assurance of eternity in His presence. No longer in need of protection from this fallen world. Psalm 91 Commentary Copyright © 2017 Steve Howells, All Rights Reserved. If you were blessed by this commentary and would like to make a contribution to support this ministry, please click here to make a secure donation. 1: He who dwells in the shelter of the Most High will abide in the shadow of the Almighty. 3: For he will deliver you from the snare of the fowler and from the deadly pestilence. 4: He will cover you with his pinions, and under his wings you will find refuge; his faithfulness is a shield and buckler. 6: nor the pestilence that stalks in darkness, nor the destruction that wastes at noonday. 7:A thousand may fall at your side, ten thousand at your right hand, but it will not come near you. 8: You will only look with your eyes and see the recompense of the wicked. 10: no evil shall be allowed to befall you, no plague come near your tent. 11: For he will command his angels concerning you to guard you in all your ways. 12: On their hands they will bear you up, lest you strike your foot against a stone. 13: You will tread on the lion and the adder; the young lion and the serpent you will trample underfoot. 14: “Because he holds fast to me in love, I will deliver him; I will protect him, because he knows my name. 15: When he calls to me, I will answer him; I will be with him in trouble; I will rescue him and honor him. 1: Whoever dwells in the shelter of the Most High will rest in the shadow of the Almighty. 3: Surely he will save you from the fowler’s snare and from the deadly pestilence. 4: He will cover you with his feathers, and under his wings you will find refuge; his faithfulness will be your shield and rampart. 6: nor the pestilence that stalks in the darkness, nor the plague that destroys at midday. 8: You will only observe with your eyes and see the punishment of the wicked. 10: no harm will overtake you, no disaster will come near your tent. 12: they will lift you up in their hands, so that you will not strike your foot against a stone. 13: You will tread on the lion and the cobra; you will trample the great lion and the serpent. 14: “Because he loves me,” says the Lord, “I will rescue him; I will protect him, for he acknowledges my name. 15: He will call on me, and I will answer him; I will be with him in trouble, I will deliver him and honor him.